While searching Etsy I found someone selling Azomite as a source of minerals. This is their description, " What is azomite? Azomite is a unique rock ore that has over 70 trace minerals. This ore was formed millions of years ago when volcano met seawater. This ore composition is only found in one place...Utah. This ore provides trace minerals that are necessary for molecular level metabolic function. In the wild, our crab friends would be able to have access to all of these trace minerals in their natural environment, since they are in captivity, we must provide them. Azomite is a granular and the crabs love munching down on it." With a little research I found it is widely used as a soil additive for farms and home gardening. It can also be added to to the feed of pretty much all types of animals in the meat and dairy industry. There was even a noticeable weight gain to shrimp when added as a mineral supplement to the water. I never heard any mention of Azomite on the forums and thought it may be a great addition to the calcium pit. 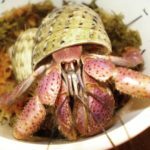 If it's only found in Utah, then hermit crabs aren't eating it. I know bentonite/montmorillonite clay has been used for hermits for decades. Many of the popular mineral mixes use this as it's pure and human-food grade.